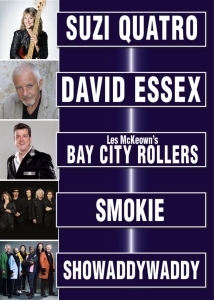 Tony Denton Promotions are delighted to bring these four iconic artistes together for the Legends Live arena tour 2019, the tour features Suzi Quatro, David Essex, Les McKeown’s Bay City Rollers & Smokie. This not to be missed tour will be kicking off at Manchester O2 Apollo on Thursday 4th April and culminates at Bournemouth BIC on Sunday 14th April. SMOKIE not appearing at this show, SHOWADDYWADDY to appear instead.